On July 20, CNAICO development strategy seminar was held in Beijing, attended by middle cadre level leadership and above and some staff more than 30 totaling. The participants had a lively discussion around five themes including “the direction of development and road of CNAICO in the coming period”, “current problems and factors constraining scientific development of CNAICO and corresponding solutions”, “views and recommendations of enhancing the core competitiveness of CNAICO” . During the seminar, the reporters prepared detailed answers and objective and in-depth analysis on a number of specific issues involved in the five themes with many practical solutions and ideas by turn. Concerning the future direction of CNAICO, the delegates depicted their own enterprise blueprint with clear development path. The meeting moved under warm atmosphere, and the seminar with an originally scheduled of a half-day lasted for one whole day, still lots of participants did not have time to speak. It was generally understood that speakers had distinctive point of view, focused, got the point, and dare to speak out the truth. Based on the thick speaking material, it could tell that participants had fully prepared and went through deep thinking. It was agreed that the strategy seminar was very timely and necessary, which was collision of idea, where participants were mutual inspired, fully mobilizing collective wisdom, and lots of useful strategic ideas were heard. In his concluding remarks, president Ji Xuecheng addressed that, seminar of today was pragmatic and efficient, where lots of insights were heard, that middle-level cadres and above of CNAICO were full of wise and competent, strengthening his confidence about a better development of CNAICO leading the team. He pointed out that the formation of development strategy was the most important work this year, also the duty-bound to middle-level cadres and above. He demanded that leaders at all levels further revise and perfect writing seminar materials and submit them to strategic management department, that strategic management department sort out the material and put them in writing timely to choose time for the re-discussion. 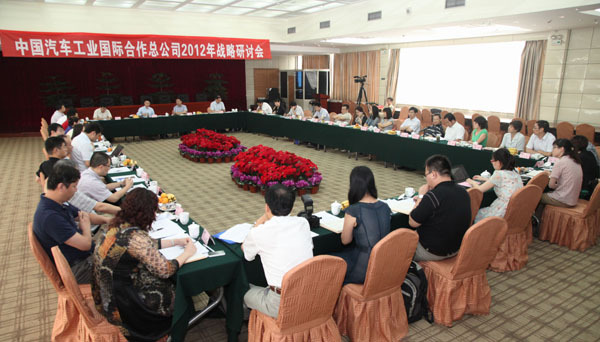 As the head of CNAICO, president Ji Xuecheng had been attaching great importance to the management of enterprise development strategies, with referring to the division of work of new leadership, he proposed himself in charge of strategy, and he personally drafted the outline of the seminar.